In part two of our ‘Rules of the Game' series, we look at five more of the crucial principles from the UK Government's, The Rules of the Game: Principles of Climate Change Communications, and how they can be applied in the workplace, through the supply chain, or to customers. Providing the same, simple message is important in sparking recognition and recall. Staff may know in a broad sense that it's good to recycle, but might not have an understanding of the reasons why and the specific benefits. In this case consistently communicating the environmental benefits recycling provides a clear indication that their actions are making a difference. Ongoing communications that reinforce the intended behaviour are likely to get the best ongoing results. Refining strategies over time, with input from staff, helps direct the message. New behaviours don't necessarily become second nature in one step but often occur in gradual stages. Ongoing communications, especially when the delivery method is varied, has the greatest likelihood of success. For example, a simple reminder at a staff meeting about turning computers and lights off at night, followed by an email a week later at the end of the day, can help ensure the practice continues. If you are communicating information about a new sustainability program, make sure there is an appropriate system in place, and link it to a core business value or policy. For example, have appropriate signage and bins placed in the right spots, such as, a ‘Cartridges 4 Planet Ark' collection box next to the printer. Influencing your supply chain will be more successful when you have multiple stakeholders endorsing the same message. At the workplace level, having messages signed off by different departments or managers will bring added strength to the message. For example, having a sustainability initiative endorsed by the CEO, human resources and finance manager will demonstrate whole of organisation support. Providing information is important but relying on information alone to change behaviour won't work. People tend to rationalise their own actions and ignore information that is inconsistent with prior beliefs. 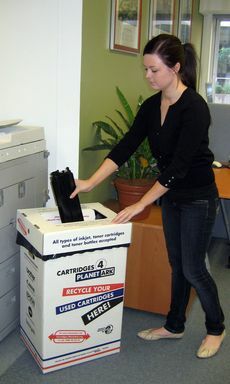 Simply telling staff that a new workplace recycling program exists may not be enough to change behaviour. However, by using the techniques we've described in this series, you should have a much higher rate of uptake for that sustainability initiative you've been itching to launch. Check out part one of our ‘Rules of the Game' series. There were 20 principles featured in The Rules of the Game report - they inter-relate and are co-dependent so for a full description, check out the whole report.